Sure, playing Angry Birds is one way to deal with job frustration during the morning commute. Another way is to take an online course that will teach you the skills necessary to land more satisfying employment. For the self-motivated and adaptable candidates that startups love to welcome, a class at Udemy might be just the ticket to finding rewarding work. 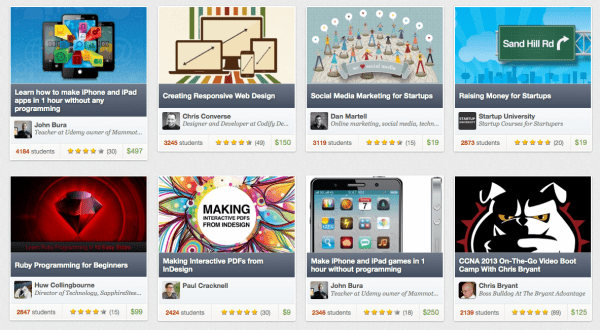 Udemy, or “The Academy of You,” has crept onto KillerStartups’ lists a couple of times, but it deserves a closer look. This platform for online education offers a wide array of courses from industry experts. The Udemy iPad app gives users even more freedom to learn on their own time, anywhere – during a break, waiting in a long line, or coming home from a disappointing day. The technology sector and startups continue to offer job opportunities in a sluggish economy. Udemy offers courses in Excel, Ruby programming, HTML, app development, social media marketing, startup fundraising and more. If you’re thinking about becoming a web entrepreneur, Udemy is an excellent resource for learning what you need to know. Students can save materials, so videos, audio lectures or text can be digested both online or off. Over 5,000 classes from teachers all over the planet liberate students to learn as they like, outside the confines of a classroom or desktop station. Classes are taught by industry leaders such as Eric Ries. Content is generated by the community, so build a class if you’re an expert, and find a course on any topic that you wish to learn. Finding the right work might mean going back to school for some, or figuring out where to spend precious savings for the first time for others. Regardless if you’re hungry to train for a career move, accelerate development in your current position, further a passion, or indulge a curiosity, Udemy offers a way to fit learning into modern lives. A four year degree program isn’t the best option for many of students for a number of reasons – budget, incompatible schedule with a current job, family obligations. This doesn’t mean professional goals should go by the wayside. 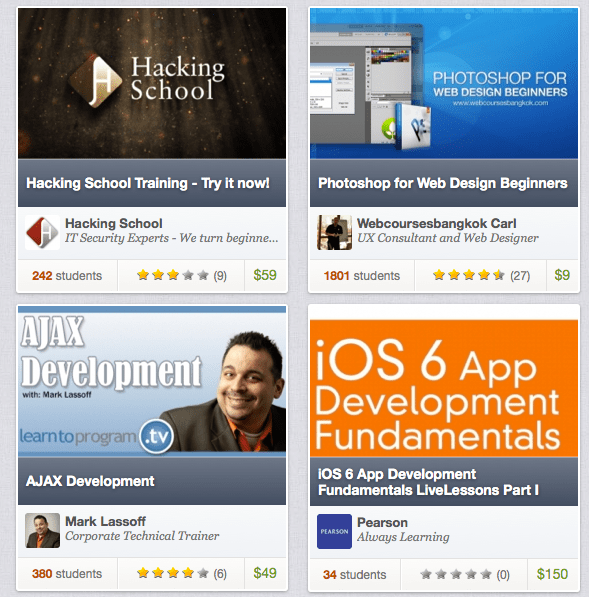 Over 500,000 students have taken a course at Udemy. And while the more rigid structure of traditional classrooms usually means that at least some material will prove redundant or of little use to students, the Udemy model lets learners cut to the chase and dive into areas of interest immediately. CEO and co-founder Eren Bali stresses that Udemy’s mission is to democratize learning. The team strives to accomplish this by first giving students access to top teachers previously available to a select few. They also try to bring down the price point of quality education. Courses range from $9 to $497. While not cheap, $199 for a complete course to “Become A Web Developer from Scratch,” taught by Victor Bastos, is certainly a much less expensive proposition than many programs. Now, off the couch with you! How many YouTube videos can you watch in a day? Or if you have no limit, wouldn’t it be great to learn how to get paid as a media expert? And if you complain that your brain needs a sensory detox first, you can learn yoga at Udemy before studying for startup success.